I am a changed moving body. My last nine months with Integrated Movement Studies is a feature film in my brain: I remember being in Utah and thinking, How am I going to complete this program and film it at the same time? I remember listening to the other participants and getting inspired by their movement explorations. I remember adventures on the weekends with Josh, Andrea, and Suzie. I remember the lightening storm outside my Utah windows. I remember connecting with a cat (Toro) like I had never done before and getting inspired to use my spine like him. I remember observing people at the farmers market and figuring out their posture based on the way they stepped onto the ground. I remember the fear of Scales! I remember drawing out a Bartenieff Fundamentals Combination of my very own. I remember Spell Drive and moving that across a practice workshop with my colleagues. I remember a Skype call with Peggy Hackney and my fellow Labanites in Utah. I remember writing my paper about Pieces of Her. I remember performing a new solo in Pieces of Her at a Roundtable for the Conference on Research in Dance 2013. I remember finding the Diagonal connection and breathing into my organs. I remember giving my grandmother a touch session in Perú, and having her muscles relax under my palms in ways I had never seen her relax before. I remember playing with baby Logan's feet and telling my auntie to make sure he crawls, so that he doesn't skip a Body Pattern that could cause possible damage in his learning abilities for the future. I remember the Atlantic Ocean flowing in and out of the Bahia beaches breathing in nourishment to the shores and bringing the shores back to the sea. I remember thinking about universal connection while I jumped seven waves on New Years Day. 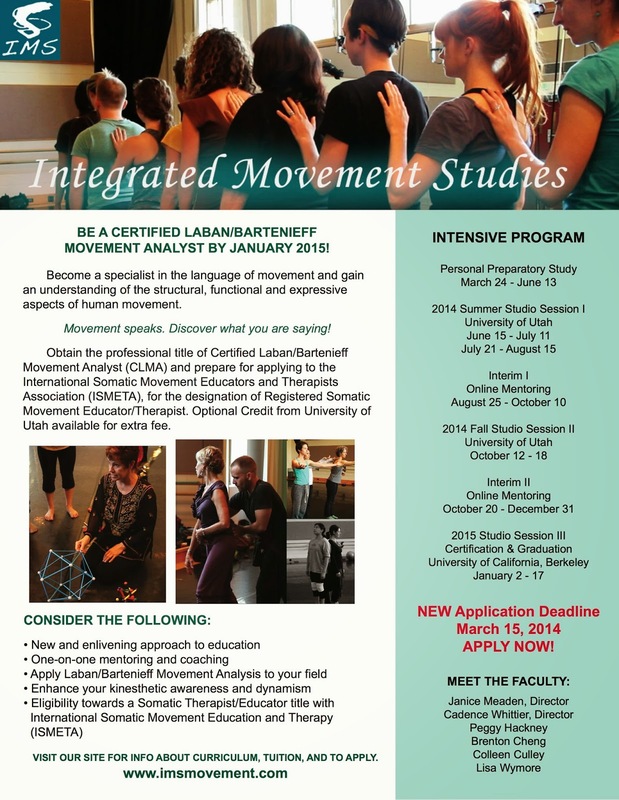 I remember my last three weeks with Integrated Movement Studies at UC Berkeley. I remember my colleagues, now friends, sharing the space with me. I remember our stories. I remember running to turn in my written exam. I remember embodying what I love, and what challenges me. I remember smiles and trust. I remember all of this. Thank you Integrated Movement Studies for the amazing work you do.